On Saturday, I decided that I should cook a special meal for Dad on Fathers' Day, and headed over to Rendinas Butchery to get some meat. (Being a proper old-fashioned butcher, they're closed on Sundays. Advance planning was needed!) I had a packet of mint in the fridge that severely needed using, so I thought I'd make Nigella's amazing rack of lamb with mint salsa. However, when we got to the butcher, we discovered - uh-oh! - that they'd sold out of rack of lamb. The friendly butcher there was extremely helpful, and suggested we go for a big ol' piece of loin chops - "more meat than rack of lamb, and cheaper!" - and jointed it for easy-carving. Lovely. I stashed the meat safely in the fridge for the next day. The savoury part of the meal is quite simple to put together, taking about 2 hours in total. This left all of Sunday afternoon free for me to bake! I definitely wanted to make a special dessert, but I didn't want to go OTT with it. I ended up making an erdbeerkuchen (i.e. sponge cake topped with strawberries), that I made, can you believe it, without a recipe. I figured out how to make it by piecing together some other recipes with a bit of common sense. Despite some trepidation, it turned out really well! I was so proud of this baby that I'm saving all the gory details for another post, hopefully to come up sometime this week. Ok, ze lamb! You brush it with mint salsa, and roast it. (Nigella's mint salsa, if you're interested in making it, is just like classic salsa verde. Just omit the garlic, anchovies, basil and mustard, and replace the red wine vinegar with white wine vinegar. Add extra mint to replace the basil, and a pinch of sugar. Ta-dah). You end up with a vibrantly green emulsion. The garlic and rosemary roast potato cubes are technically a Nigella recipe, but they're more of a simple guideline than a hard-and-fast recipe. Cut potatoes into 2cm cubes, toss with olive oil, unpeeled garlic cloves and rosemary, and roast at 200C for about an hour, depending on how cooked you like them. Because they take a bit longer than the veggies, I popped them in under the lamb for the last 15 minutes of cooking time, then took the lamb out and put the veggies in. I had washed and trimmed and chopped my chosen veggies, shoved them into a roasting tray, and drizzled them with olive oil. They take 45 minutes to cook, during which time the lamb was resting, safely insulated under a tent of foil to keep it warm. I was initially planning to strew the veggies with chopped parsley, but I rather liked the warm earth tones as they were. As you can see in the photo of the raw lamb, I bought 2 pieces of meat, to feed 4 of us. (Ok, technically that was enough meat for 5... but we ate it all. Don't tell anyone!) The smaller piece of meat was jointed just as the butcher said it would be, so it was easy to slice between the bones to make individual pieces. The larger piece, however, had a thin, flat bone running along the length of it, which I couldn't cut through. It was no biggie though, as we just hacked at it with our steak knifes to prise the individual pieces off. Not entirely civilised, but effective. The meat was fantastic! And the bright green sauce is a wonderful accompaniment. Only a small amount is needed to anoint the meat before roasting; the rest is a fabulously fresh sauce. To my surprise, all the roast veggies got eaten! I didn't think anyone apart from me actually liked fennel. Cool. I loved squishing out the soft roast garlic to eat. That, my good friends, is flavour country. Normally we like a bit of rest between a big meal and dessert, but we ate dessert almost straight after dinner. My brother was super-keen to get stuck in, jumping up to clear the plates and bring the cake to the table. I was pretty full, and could only eat one slice, but my folks all went back for seconds, amongst protestations of, "I shouldn't... but it's not fathers' day every day!". We ate our slices with softly whipped cream. Oh, how lecker! Stay tuned for a more detailed post about the erdbeerkuchen! Is that Australian Father's day? Our Father's day here in Canada and in the US is in June. Yup! First Sunday in September is Fathers' Day here in Aus. That meal looks fabulous :) I too love eating roasted garlic...and I LOVE fennel, unfortunately it just won't get cheap over here. Looking forward to your next post, those strawberries look lush! 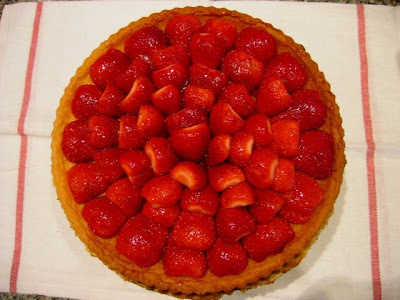 Everything looks so delicious, but I must say that the tart is especially beautiful!! Sarah, how soon can you come over to the UK and be my daughter? May I suggest with the roasted potatoes - if you par-boil them first, drain and shake in a colander (to break up the surface) before you roast them, you'll get really delicious crispy taters. Thanks guys! It was an enjoyable meal to cook. What a beautiful meal! 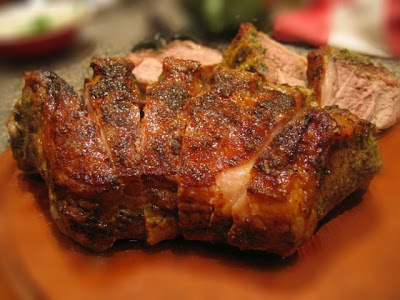 From the savory lamb to the sweet dessert, it looks like it was made with a lot of love :).